Mornings like this make me question the child safety of my house. Also my intelligence for not noticing Zev is tall enough to reach the knife rack. 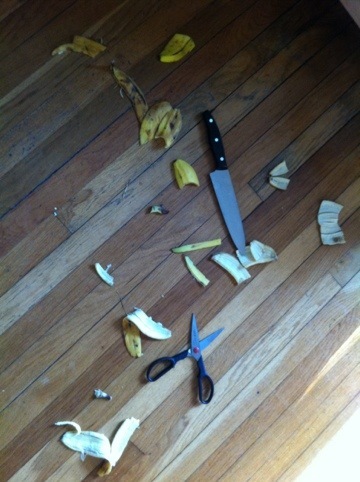 It’s a scary thing to come downstairs and find your children presiding over a banana massacre. As I was cleaning up, I thought I saw some blood on Meorah’s cheek, but it came right off without a mark and she wasn’t at all upset (except for being prevented from completing her sacrifice), so I let it go. Later while changing her I noticed her left hand was bloody and I found the cut on her index finger right by the distal knuckle. Deep enough to make me feel lucky I wasn’t taking a trip to the ED with a bag of ice. A few minutes of pressure and a swipe of liquid bandage later and I think we are good as new. So, two lessons from this, one for me (and Sarah) and one for Zev. For the parents: reevaluate child safety requirements at each stage, and don’t over estimate your child’s ability to recognize danger. For Zev: I don’t care if you are being chased by a man in a hockey mask, you don’t play with knives or scissors, ever.